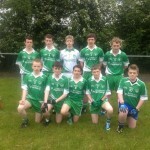 Our Under 16 Boys play Owen Roes tonight at Clanabogan Park at 6.45pm. Our Boys have had a good start to the League winning 6 out of 8 games and have already qualified for the quarter finals. All support is welcome for this important match tonight. Under 16 Championship quarter finals take place on 27th September in which we play the winners of Owen Roes v Rock.